In the Middle Ages, drinking water often was scarce. Why? Because most water was unfit for human consumption. In a lot of cases, if you drank it, you got sick. Sometimes worse. So the poor drank beer, cider or mead, and the rich typically would drink wine. In fact, beer at this time was seen as a healthy drink (probably because unlike water, it couldn’t kill you … unless you drank a LOT of it). It is well documented that human pathogens can’t grow in beer. Sure, a beer can spoil, but it isn’t going to grow E. Coli and put you in the ground. And that isn’t due to the alcohol, as many assume; it’s due to the high pH content. In fact, some believe beer had a hand in saving us as a species, thanks to the fact that many people in Medieval times died young because of the pathogens that existed in drinking water. New Albanian Brewing Company’s ongoing battle with the FCHD has been well documented, and Roger Baylor reported on his blog recently that the department had taken a photo outside Bank Street Brew House of a FCHD truck. Naturally, all following the story wondered what the department had up its sleeve. 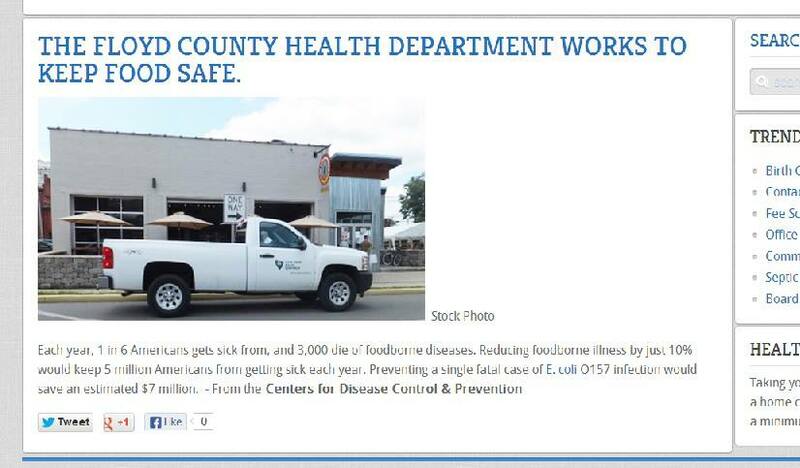 The answer to that wonder is the photo above, which apparently was posted on the department’s website with a headline about how hard the department is working to “keep food safe,” and captioned with sad rhetoric about the dangers of food-borne diseases: specifically, human pathogens that cannot grow in beer. The suggestion, of course, is that the FCHD had at some point been dispatched to Bank Street to deal with some sort of health issue, which of course is entirely untrue. The health department has officially gone too far, and has made itself look vindictive, pathetic and even a bit stupid in the process. In fact, it’s a bit offensive to me that those behind this lunacy honestly believe they can sway people with such tactics. In essence, they are insulting the public’s intelligence by assuming we don’t know the difference … or are too lazy to simply look up the facts on Google, as they should have done. So, honestly, we all should feel we’re part of this battle, and should be as angered by the public injustice, and this slap at our collective intelligence, as Baylor is. Baylor has urged by way of Facebook that we wait to see what the department’s decision is on his appeal, a decision which should be presented this week. If the FCHD continues to defy its own policies and make a total mockery of due process and, frankly, government in general, there are more steps that can be taken. And such steps will. Baylor is determined to see this through, and his support seems to grow in the meantime. I, for one, can’t wait.